Jamie Lee, founder of Kids at SWiTCH, is changing the way kindergartens, schools, childcare centres, sporting groups and parents entertain and educate children. Boasting a hybrid entrepreneurial skill-set: strong academic accomplishments, business acumen and impressive leadership skills, Jamie is an entrepreneurial figure and thought-leader in the education sector. She has pioneered a new model for education and social innovation that allows children to discover and enrich their own personal tool kit. After completing an Education Degree at Macquarie University, Jamie went onto complete a certificate in Financial Accounting at Harvard’s Extension School. She is a staunch supporter of innovation and education, and her mission is to foster financial literacy and translate instinctual passion and sense of play into a sense of unshakeable purpose. Restless and ready to push boundaries, Kids at Switch was sparked; ‘I constantly see that when kids are given the opportunity to discover their passions, they move, learn and live with a stronger purpose,’ she says. Anyone can create a company, but it takes a community to create change. The dream that would become Kids at SWiTCH developed while I was completing my Education Degree at Macquarie University. Throughout my life I’ve observed an old maxim: success breeds success, and the rich get richer. I felt like our current system of education had failed to equip students with the tools for this kind of independence. Financial inadequateness doesn’t stem from a lack of support or motivation, but an absence of practical knowledge. My mission is to foster financial literacy in each of our students through their natural curiosity and passion for play. Like any sustainable business, finance is a business function I don’t overlook. I have a very skilled team who I work with to set prices, but generally parents pay for a term of tuition, like any other tuition centre. With that said, I don’t see money or material assets as the key motivator for me in the business. This is something I teach through the Kids at Switch curriculums too; we should have jobs that reflect our passions, and which foster intrinsic motivation and fulfilment, rather than extrinsic rewards. Mine just happens to be Kids at Switch. Right now, Kids at Switch is going through a phase of renewal. We’re redesigning our curriculums to ensure maximum quality and also giving ourselves an online facelift! Check out our new website design! In the next three months, we’re probably going to take our revival a few steps further – I can’t give too much away, you’ll just have to wait and see! When I found my mission, I became the little girl with a big dream again. While juggling assignments and two part-time jobs, I pushed myself further by completing a Certificate in Financial Accounting at Harvard’s Extension School and worked alongside my Godmother to gain additional managerial experience. At night I worked from my bedroom, sketching away concepts, stories, ideas and inspirations into my notebook. I’d get so involved with learning that I would look up at the clock thinking it was 7 or 8 in the evening and quickly realised that it was actually 1 or 2 in the morning. Everyday, I set my alarm for 6 a.m. – and no later than 7 a.m. Often I’d be out of my house to work before any of my family members were awake. At 23, straight after I graduated from University I took a steep learning curve and got straight into the unknown in starting up the business. So I guess the one requirement to turn ideas into reality is effort. Either you make the commitment to make it to the top and get results, or you don’t. Hiring the right group of people. I believe a business’s success is all about people. When you are the leader of a business, you must create a culture of growth. When people in your sphere of influence know that personal growth and leadership development are valued, resourced, and rewarded, then growth will explode. Well, here are five things that I’ve learned in the first two years of starting Kids at SWiTCH. The one requirement for success in any industry that you want to start out in is effort. Either you make the commitment to make it to the top and get results, or you don’t. Make working on your business your priority. Many people who start a new business spend too much time working in their business that they don’t spend enough time to grow the business. A business’s success is all about people. When you are the leader of a business, you must create a culture of growth. When people in your sphere of influence know that personal growth and leadership development are valued, resourced, and rewarded, then growth will explode. Overthinking ruins you, ruins the situation, twists things around, make you worry and just makes everything much worse than it actually is. Have fun! No matter what happens – win, lose or draw, never forget that life goes on and why not have fun along the way? 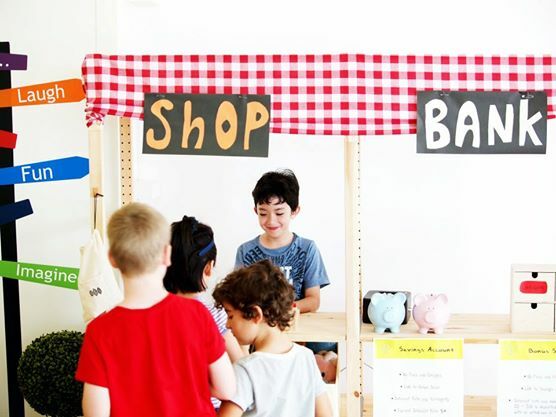 Within Australia, currently we are the only business that teaches children about financial literacy and entrepreneurial skills within a simulated learning mini economy. In terms of education and innovation, I particularly love d.school, IDEO and Brightworks. Anyone can create a company, but it takes a community to create change. So I think truly great businesses are inspiring. They create loyal employees who are attached to the company and its mission rather than only to their own careers. They realise that their primary job isn’t about figuring out what they can get done and cross off their to-do list, but how many people they can help along the journey. So it’s all about empowering people to create that ripple effect. Kids in Philanthropy – The mission of Kids in Philantropy (KiP) is to create a fund to teach children the art and skill of giving, which is closely linked to our values. Children from the ages of five to 18 years are encouraged to participate in our programmes along with their families, inclusive of siblings, parents, grandparents, uncles, aunts, cousins, etc. Whenever people ask me who my inspirations are, I think many expect me to say “Branson”, “Sheryl Sandberg” or “Oprah”. The truth is though, I don’t know any of them on a personal level, and I don’t follow them on social media either. The people who I follow or who inspire me tend to be the people that I have intimate connection with. They tend to bring out the best in me, rather than the stress in me. I would love the opportunity to find the right investors for the business. I believe I’m at a stage where I’m ready to go bigger, and all I lack is some external support. I have a fantastic team, a really strong vision, an established curriculum and an untameable passion. But whilst I know as a relatively new business people usually don’t see immediate value or worth, I have placed my entire heart and soul into Kids at SWiTCH, so I believe there is definitely an investor out there who shares the same passion I have for education and is willing to help change the schooling system. How do you offload business commitments after finding a really strong team? This was a question I found myself asking once I got my hands on a fantastic team. I had gotten so used to doing things myself that I found it really difficult to let go. It took time to learn to trust other people with Kids at SWiTCH – you really come to grow attached to your business like it’s your child! But once I learnt how to let go and have faith in my team, and that they were getting the job done, I realised that I had moved my business leagues ahead of what it was before. One of my hobbies is to visit nice cafes during the middle of my busy week, and my favorites are The Grounds of Alexandria and The Boathouse, Palm Beach. I look for cafes that produce more than just a cup of coffee, but a wonderful experience for me to take a break from work and a chance for relationship building. We thought it would be cool to crowdsource a prize to award to the interviewee’s choice (each person interviewed gets one vote) winner for the year’s best interview. Are you willing to kick in a prize?